Alexander Girard's lovely and abstract design, titled "Eden," graces this giant floor puzzle. At 24 x 36 inches, this jigsaw puzzle is made up of 24 jumbo-sized pieces. This is the latest design in our growing line of educational, fun, and beautifully designed puzzles. Kids ages 3 and up and their design-savvy parents will enjoy this future classic. This 24-piece giant floor puzzle features and abstracted version of the garden of Eden, including flowers, birds, and other creatures. Young children will enjoy this colorful and challenging puzzle that encourages fine motor skills and early cognitive development. Overall size is an impressive 24 x 36 inches. 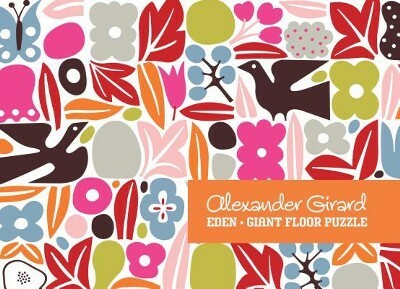 I'm the author/artist and I want to review Alexander Girard Eden Giant Floor Puzzle.